These five gilt buttons are what button manufacturers refer to as "rich orange colour." One button has this back mark, which refers to the color and quality rating of the gilt button by button manufacturers. They were popular from the late 18th century through the 1850s. 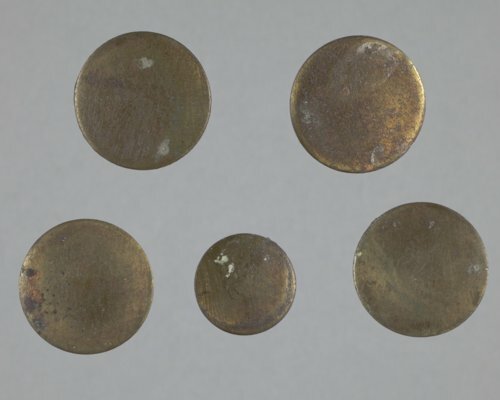 However, these five buttons were recovered from Fort Zarah, located along the Santa Fe trail in Barton County, which was active only from 1864 to 1869. They were excavated during the 1969 Kansas Archeological Training Program field school, a joint project undertaken by Kansas Historical Society archeologists and Kansas Anthropological Association volunteers at Fort Zarah.